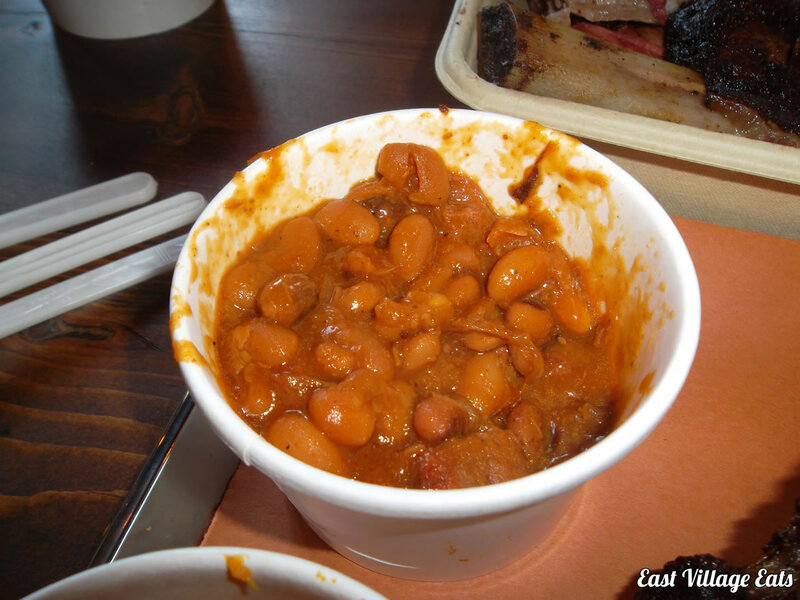 Normally when I think of good barbecue the first thing that comes to mind is a rundown old shack down south with a potbellied pitmaster that has been smoking meat for the best part of his life, not the epicenter of the East Village. 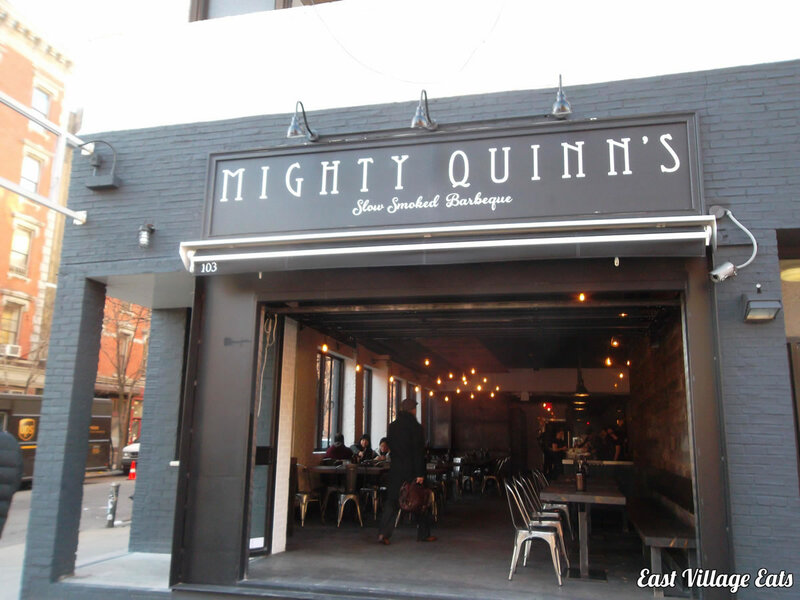 Mighty Quinn’s BBQ (which began at Smorgasburg) hopes to change that with it’s first brick & mortar location in the former Vandaag space. I went to check the place out with a friend on opening day (hence the open garage door) in December & there was already a buzz about the place. 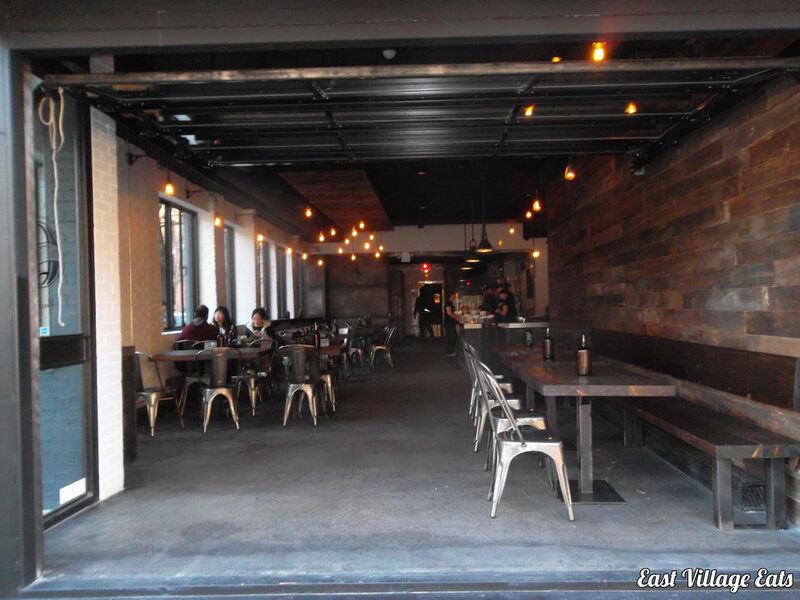 Gone are Vandaag’s bright colors, but the layout is still very similar except for a large communal table which makes up most of the rear dining area. The smell of smoked meat hits you in the face as soon as you walk in (building residents have already filed complaints) & trust me, it’s enough to get your mouth watering. The setup is pretty typical of BBQ Joints here in the city (see my reviews of Hill Country & BrisketTown): order your meats & sides at the counter, grab your tray & find a seat. There were some problems with the pos system when we went to pay, but I’m sure they’ve worked out the kinks by now. They have quite a selection of smoked meats, but we ended up trying the brisket & the appropriately named Brontosaurus Rib. 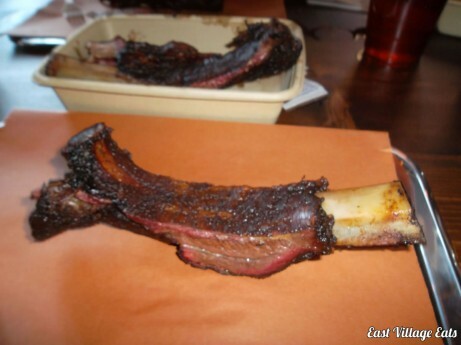 I have no idea where on the rib this was cut from, but it looked like something straight out of the Flintstones. I’m normally a spare rib (also on the menu) man myself, so I thought the ribs weren’t as tender as I would have liked, but they did have a great smokey flavor. The brisket was moist & smokey, exactly what you want. 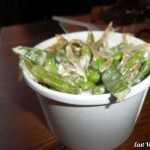 They also have smoked sausage and pulled pork (in sandwich or platter form), chicken & coming soon; wings. Things got interesting with the sides. 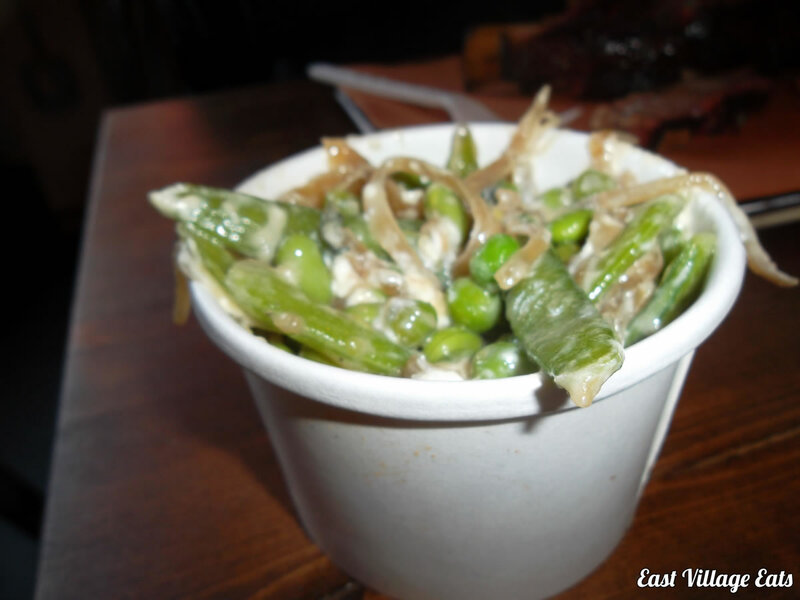 Obviously we weren’t going to pass on the sweet potato casserole with maple & pecans or the Burnt End Baked Beans, but the real star was the Edamame & Sweet Pea Salad. 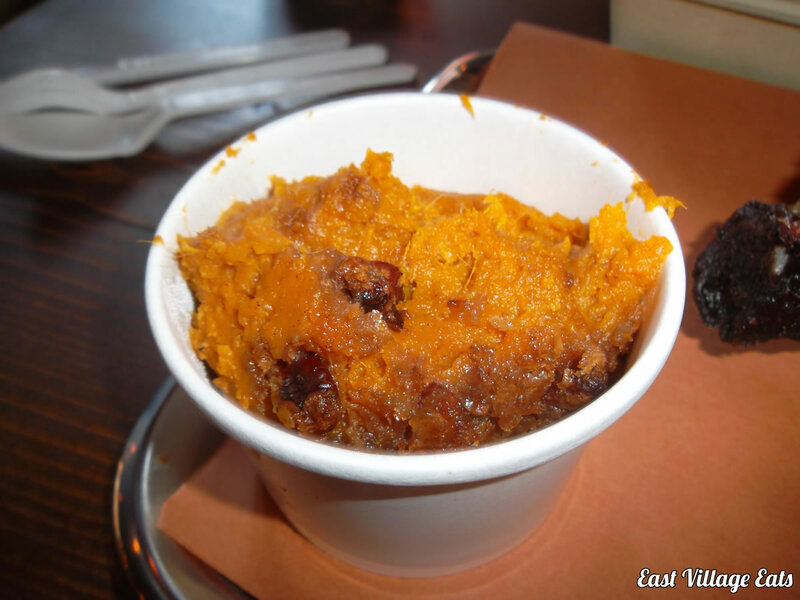 I would have never imagined I’d see this at at BBQ joint, but the flavors totally worked & it was very refreshing. I really think it’s a must have. I also tried some of their house made Smoked BBQ sauce, although the ribs didn’t really need it. 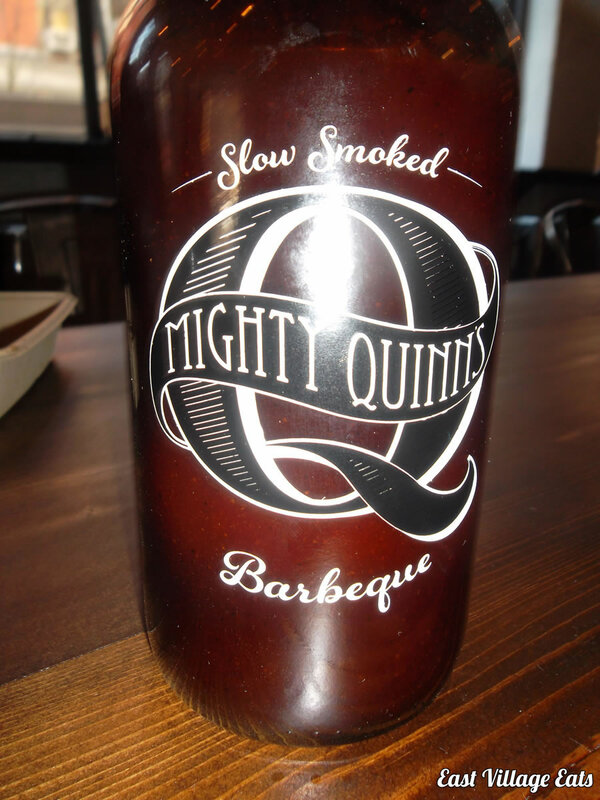 As is custom, Mighty Quinn’s offers a few free add-ons: Pickled cumber, red onions or chiles. There are quite a few beers available with 8 in bottles ($6) & 8 on tap (they offer growlers too at $26). Don’t expect a Bud Light or anything like that, these are all from small breweries like Founders & Speakeasy. 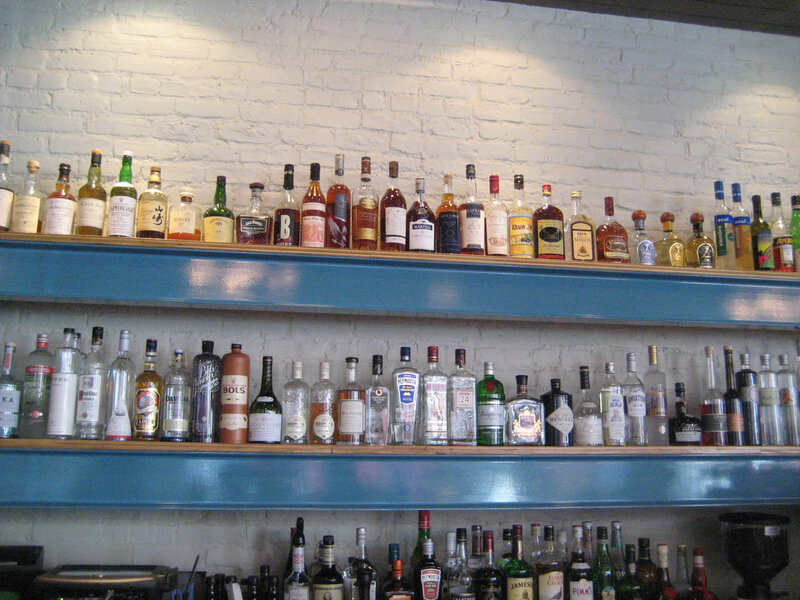 You might remember Vandaag’s extensive liquor selection from previous posts. We spoke to one of the owners when we were leaving & asked why they had decided not to offer liquor. Basically (as we had suspected), the emphasis was on the food & they believed that liquor would take away from that. I enjoyed my meal at Mighty Quinn’s. As with any new restaurant, the experience was not without it’s hiccups, but I will be going back there. I’m particularly interested in trying out the chicken.